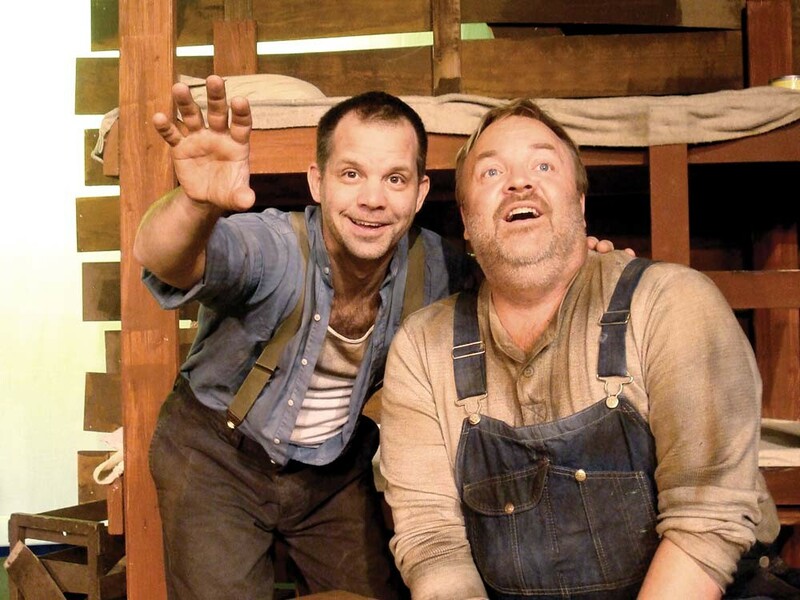 In Lake City’s Of Mice and Men, actors sparkle but dreams die. We wanna see the rabbits, George. Show us the rabbits, too. Sitting cross-legged on the ground like a little boy, he rocks back and forth, self-comforting. With his lips trembling, he tugs on the legs of his filthy denim overalls. Fluttering fingers wipe nervous sweat off his forehead. When he’s worried — and he’s usually worried, because he doesn’t understand half of what people say — he jerks his head spasmodically and averts his eyes. With his masterful characterization of a mentally impaired man, David Gigler’s performance as Lennie Small in Lake City’s Of Mice and Men sets the tone for a production of a script that exerts a primal pull on viewers’ emotions. Sure, it’s been filmed three times, and you read it in high school. But Steinbeck’s morality tale of migrant workers during the Depression shouldn’t just be checked off as a been-there, done-that classic. Steinbeck’s characters act generously, form unlikely friendships, envision a better future. Sometimes they’re cruel, of course, and nobody ever has any money. But when the kind-hearted ones have their little victories, we smile the way Lennie does when his traveling companion George tells him bedtime stories. George Green has played his namesake before, and as with Gigler’s Lennie, it shows in his attention to detail. Portraying the father-figure for this big lunk of a man-child, Green catches both the tenderness and the resentment: He’s glad to care for Lennie but wishes he could stake out on his own. When he can’t supply any ketchup for Lennie’s canned beans, Green’s smiles are clouded with guilt. Later on, when it looks, momentarily, as if George might actually be able to purchase the little farm of their dreams, Green paces around and grimace-grins: He’s happy-anxious in the way people are when their desires crowd in too close. In the opening scenes, director Dan Heggem lets the tension linger (in low-key lighting of his own design) while Green and Gigler complete their characters with well-observed gestures. But the deliberate pace doesn’t serve the second act’s flurry of incidents. And while Chris LeBlanc provides sage counsel as the foreman, several supporting actors lack conviction. At least the social-outcast theme is carried forward by Norm McBride, who bestows dignity on an old ranch hand, and David Casteal, who lends his resonant voice to a crippled, embittered laborer. When it comes to tramps like George and Lennie, the world doesn’t care enough even to treat them unfairly — it just happens. After seeking a better future for themselves, they fail. But watching performances as good as Gigler’s and Green’s instills a little hope, at least, that somewhere, somebody like us deserves a little happiness.